Philip Cummings was born November 19, 1906, in Hardwick, Vermont, a small town of about 2,500 in the north-central part of the state. Hardwick was a busy commercial and cultural center when Cummings was a boy, with thriving schools, churches, and fraternal organizations. Its banks, hotels, general stores, specialty shops, and multiple other businesses offered all the products and services local townspeople, farmers, and tradesmen might need. The St. Johnsbury & Lake Champlain Railroad made several daily stops and telephone service was available to those who could afford it. The Vermont granite industry was flourishing then, and Hardwick was a granite town. 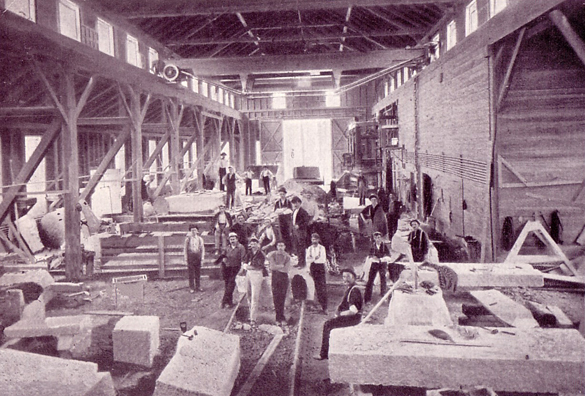 The Woodbury Granite Company, headquartered in Hardwick, operated a quarry eight miles outside the town, extensive stone-cutting and finishing sheds within the town, and a railroad line connecting the two. The company was internationally famous for the efficiency of its operation and the quality of its stone; in 1910 and 1911 alone, it produced the finished granite for 50 post office buildings nationwide. By 1913, the Woodbury Granite Company was the largest granite business in the world under single management, employing many hundreds of skilled workers from Scotland, Italy, Spain, Poland, Sweden, and other granite-rich regions of Europe. In many ways, [Hardwick] is not unlike scores of other rural communities scattered throughout the American landscape, built on industries that long ago packed up their bags and left. In Hardwick, that industry was granite, and it's hard to overstate how much vibrancy, excitement, and money the stone provided the town. —Ben Hewitt, The Town That Food Saved: How One Rural Community Found Vitality in Local Food (New York: Rodale, Inc., 2009), 7. Woodbury Granite Company Shed, Hardwick, circa 1910. Courtesy Hardwick Historical Society. 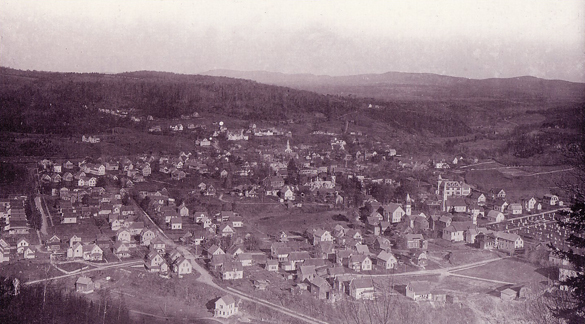 View of Hardwick from Buffalo Mountain, circa 1905. Courtesy Hardwick Historical Society.